When we think about remodeling our home, often what comes to mind is a classic image of a plain room transforming into a gorgeous picturesque open space, straight out of a magazine. Yet underneath the glamour there is another important piece to a remodel for every homeowner, and that is functionality. The greatest priority for Lisa and Rusty, Arlington homeowners, was moving their parents into their home. They knew they needed an addition to accommodate Rusty’s Father, both of Lisa’s parents, and both of their children along with themselves in their current space. They didn’t know how to best use the space they had or how best to add to it, so they reached out to Sun Design. Incorporating existing space into the design, we began the magic of reinventing their home for how they want to live – today and for years to come. We planned to accommodate private areas for each family unit’s needs, while taking into consideration the amount of space we could add on to the home to keep within the strict zoning regulations for Arlington County. Another factor was their family budget. Expenses weren’t unlimited, and there were areas that could be expanded but didn’t have to be, such as the single restroom on the second floor used by Lisa, Rusty, and their two daughters. We came up with three options to achieve their intentions for greater space with added privacy and continuity. Keeping within their budget, option 1 added a private area for Lisa’s parents on the first floor, while giving Lisa and Rusty a private balcony off of their master suite, and a family outdoor space on the main living area. Option 2 offered a decorative hipped roof as well, and closed in the main level deck making it a screened in porch. By giving them a screened porch, we also added the option for Lisa and Rustys private balcony to be more spacious, utilizing the full footprint of the screened porch roof as their balcony footprint. Option 3 offered less outdoor options by making the back deck smaller and pushing the house back further. This gave more room for the common family area on the main floor (to include the kitchen and dining room) and gave both Rusty and Lisa’s master suite, as well as enlarging their daughters’ shared bedroom. For this option the decorative hipped roof design was removed and the top area expanded back further. 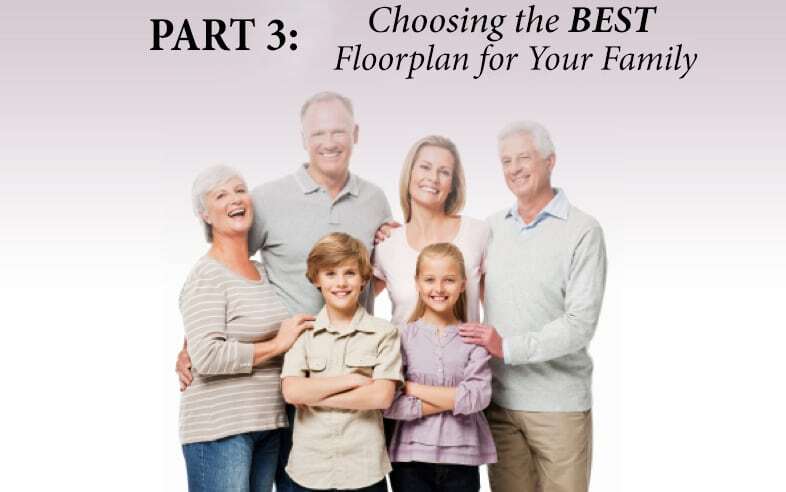 It was a difficult choice for the family as each design provided a different specialty to be cherished. In the end, it wasn’t the picturesque artsy designed roof or the enhanced outdoor connection but the functionality of the interior space that won their vote. Having larger interior spaces for each unit to enjoy together, with larger interior gathering areas made everyone feel as though they would continue to prosper as individuals and a family unit together. Going through the design process with Sun Design gave Lisa and Rusty the creative alternatives they needed to make an intelligent decision on their future home. Lisa was able to integrate a home office area in their master suite, their daughters gained a study off of their shared bedroom, and Lisa’s parents were able to achieve a much desired heritage room off of their bedroom. With Rusty’s dad at the front of the house, able to take advantage of the front living room – it was a win-win for all!